World cup 2010 : Vuvuzela - a curse? The roaring sound of the Vuvuzela is set to become the sound of the 2010 FIFA World Cup. But after the first day matches one questions if this sound pollution can continue throughout the whole tournament. FIFA and South Africa might be forced to press in action as protests are likely to increase. 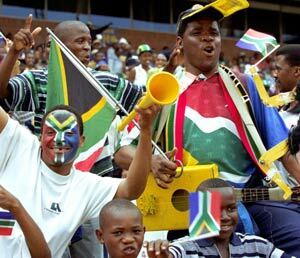 Surely the Vuvuzela is part of South African football culture, but even while watching the matches on the television it is a persistent noise which does disturb the whole football experience. At least it seems to be a problem to me and a number of persons I have spoken to. And another problem is listening to the commentators - it has become difficult with such strong sound in the background. Someone from Asia told me last night that they actually couldn’t understand the commentary even through the commentator was trying his best shouting into the microphone. And if we feel like this, how is then the live experience in the stadium? In South Africa Dutch national coach Bert van Marwijk has gone to the extent to ban Vuvuzelas from the training of his team. Van Marwijk’s simple explanation, I need to communicate with my players and under such circumstances I cannot do so. Others might follow in the coming days. One remembers that the Spaniards had complaint about it last year during the Confederations Cup and some had even asked for a ban of the Vuvuzela. In Europe the Vuvuzela is a topic for heated debates. Here in Germany the Vuvuzela has been banned by a number of cities and public viewing venues as they say it is a risk to the ears. In Cologne city people will be fined if found blowing into the Vuvuzela.